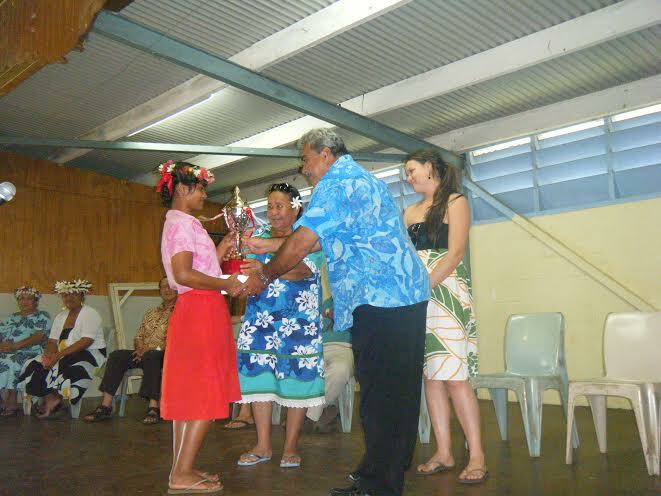 Araura College held its first ever quarterly leadership award assembly to celebrate the leadership qualities of one particular student prefect – Fasolo Tekatau. The event was made possible by Mr Teina Bishop (the former Honourable Minister of Education) and his family, after he pledged during the Student Leader Investiture Ceremony back in March this year to award an ipad and a trophy to the most deserving student leader every term. The trophy is named the Simona Naku after the College’s 1976 principal – “this was a man that inspired me to do well in my education” Mr Bishop told the audience. The trophy was presented by Mama Mata Toka, the daughter of Mr Naku and the ipad which was sponsored by the Bishop’s store TNM was presented by Miss Tania Bishop, daughter of Mr Teina Bishop. Fasolo won the award this term through her efforts that she has put into her daily break time activity of the reading club. She worked hard all term helping and encouraging students of all levels to read. Congratulations Fasolo from all the staff and students at Araura College.